There is a lot said about the Principality of Monaco, that it’s expensive and glamorous. Well, they’re both true comments, but at Monaco the best of the best come out to play, to re-live the heroic efforts of those past Grands Prix de Monaco. This year saw the 9th Grand Prix de Monaco Historique, the first held in 1997. Initially the re-enactment was held the weekend prior to the Formula One Grand Prix, but logistics strains between the bump out of the Historique and the bump in of the GP led to the Historique now being held two weeks prior. Apart from safety upgrades, including construction of a swimming pool that diverts the track over the harbour floor, the track itself has the same inclines and descends as it did when the first Grand Prix was held there in 1929. The interesting fact about the Principality is its size – the entire footprint of Monaco is a mere 440 acres – that’s the size of a large hobby farm in Australia! Much of the land size is reclaimed land from the Mediterranean. Yes, it’s glitzy, but with the glitz and glamour comes a lot of hard work – walking. The hilly terrain brings with it a complexity of knowing the quickest way to get to the furthest place. Walking accounts for most, but there are tunnels and shortcuts provided by means of various staircases and hidden lifts. The lifts aren’t quick, but they provide a great resting point after a lot of walking. There’s also the bus network, very handy when there’s not a Grand Prix on! It always fascinates me about the arrivals to an event. Many hours are spent by competitors and crews on preparation; it doesn’t all happen on the three days of the event. At Monaco this is very true. Registrations to lodge Expressions of Interest to enter open many months prior to the event, then the committee carefully goes through all the applicants and selects those that suit the criteria. The main criteria are – no fakes. All cars here are original with racing history.it was reported that the organisers knocked back an entry from the Lancia D50 recreation (the surviving original is in a museum never to be used again, some years ago many original parts were used to construct 6 replicas). The purity of Monaco is that Lancia D50s are regularly raced at other historic events such as the Goodwood Revival. The arrivals and scrutineering take place across two days – Wednesday and Thursday. The paddock area remains secure during this period, but fully accessible to the public to wander around. It was a great opportunity to watch the workers putting finishing touches to the track – the detail in painting the curbs, and the television crews putting together the numerous super screens & the large cranes finishing off erection of the grandstands, many of which have lifts to catapult VIP patrons to the hospitality suites. Historic racing is big business in Europe. Transporters arrive by the dozen, many companies with accompanying parts trucks/vans. Hall and Hall topped the list with 15 cars under their management banner, Classic Team Lotus with 8 and Sid Hoole Racing with 9. Hall and Hall for instance had 3 transporters for the cars and 2 vans for the parts. There were then the smaller trucks, enclosed trailers and uncovered tandem trailers. But for some the experience of competing is that the meeting is just part of the attraction. To drive the competing car to and from the meeting is also an attraction. This was the case for two of the three competing Australians. The chance to drive from the UK to Monaco was grabbed with much enthusiasm by Victorians Andrew Cannon and Adam Berryman. Their drive commenced that Monday morning, taking them through all sorts of conditions through the French Alps, the scribe understanding that they ventured on almost all the Mountain Passes, even through snow. This monumental drive was completed in Andrew’s 1927 Bugatti T35B/51 and Adam’s Bugatti T37A. they were accompanied by Tim Dutton in his competing Bugatti T35B, fellow Victorian Jeremy Mantello (offering support to Adam) and Morris Wright and his girlfriend, Annetta from New Zealand. Morris responsible for the mechanical part of the restoration of Andrew’s T51. Interestingly, the T35B/51 boasts this number match as it was originally sold new as a T35B, but shortly after upgraded to T51 specifications to maintain competiveness to the mighty Alfa Romeos of the period. This is visually highlighted when opening the bonnet on the driver’s side – you can see the patch marks from the differently located blow out hole from the supercharger off the T35B engine to that of the two overhead camshaft engine T51. The paddock area had a somewhat bizarre quietness to it on those two days as very rarely was there an engine ignited, but what a sight. The pit lane garages occupy the 1973-1978 Formula One cars, which required a special pass to get near, but the main paddock area (for all 6 other grids) was freely open, and in a great location too. It is located on the western side of the harbour – at harbour level with about 60 or so competitors experiencing the ultimate position, located one metre off the water (a small fence between). This paddock area blocks access to the Riva Marine group’s business activities for this period, their boat cranes lying dormant. Accommodation options are varied in Monaco, not as many motorhomes that you see at other events in Europe with many competitors choosing from the array of quality hotels & resorts, but for some with slightly higher budgets, docking their own boat in the harbour, or hiring one is the preferred choice. The third competing Australian was among those fortunate to have a harbourside paddock marquee spot. Tasmanian, Scotty Taylor does his European racing in style these days, just turning up and going racing while the employed crew prepare, transport and maintain whichever car he is racing. Entered at this meeting is his ex. Innes Ireland 1961 Lotus 18 F1. It has the four-cylinder Coventry-Climax twin-cam motor. A very historic car, it’s the most driven Lotus 18 in racing history having competed in no less than 31 Grands Prix in period. I first caught up with Scotty as the scrutineers were present at the Lotus 18 on Thursday morning. Scotty recalled previous runs at Monaco Historique where the scrutineers had knocked back his race suit undergarments, so in 2014 he brought along a full spare – just in case. All was looking good until they asked to see the rain light in operation. Well, it didn’t work. Scotty’s lead mechanic ‘Mary’ (nicknamed so as his surname is Poppins) checked all the wires with no avail, so the scrutineer agreed to come back some time later to see a working rain light. ‘Mary’ advised us that he would need to remove the fuel tank to get to the wiring. In order to remove the fuel tank you need to drain it too, so Scotty suggested that he’d be best placed not to be there (in the way) so we went off to the Credit Suisse Drivers’ Club for a coffee. This is where you start to see the hefty entry fee ($7,400 AUD approx) get value for money. The drivers club is in pop=up structure beside the current Yacht Club building (a new Yacht Club is nearing completion across the harbour) and was designed to replicate a Swiss Alpine Chalet. The use of timber, and timber look-alike was excellent. The ceiling looks solid timber drapped as a vaulted ceiling at first glance, but a second look reveals that it is fabric to match the surrounding timber. A barista is on hand to brew an excellent coffee, although Scotty and I forgot where we were & got a short black– suffice to say, didn’t need another one after that. Scotty reminisced on his first drive at Monaco (following his 21 Bathurst 1000 starts as one of the most successful privateers) at the 2006 event when he hired a Shadow DN1. This experience, he says is what inspired him to build his collection of open-wheel and sports-racing cars, which he now competes nearly every week during the European season each year. We made our way back to the Lotus to find ‘Mary’ still ‘under the bonnet’ (so to speak), but having traced the fault – a broken switch. Luckily a spare was found in some of the other Sid Hoole Racing spares, so all was put back together, some previous dodgy wiring repairs repaired & the rain light tested – to great success. The scrutineer came back, reviewed and signed off the car’s validity to race. A side note to this was a comment from Jochen Mass during one of his storytelling opportunities across the weekend reliving the 1972 Formula 3 race when he drove for the March Works team. Following an accident during practice in the pouring rain he was to start off the back of the grid. The scrutineers saw on the marshalling grid that his rain light wasn’t working, but the stewards said: “don’t be a fool, his last anyway, he doesn’t need a tail light, his last off the grid.” Well, by the end of lap one Jochen recalled he had passed 11 cars, then finished 7th in the race. With the other Australian competitors yet to arrive, I went for another wander around the paddock. One car that has certainly caught my eye over the years in its appearance at the Phillip Island Classic – the Gurney Eagle F1. The distinctive Eagle-beak on the front nose of these cars is what sets them apart, and when they’re fitted with the Weslake-V12 engine with its four stacked exhaust pipes it make it rank amongst the most beautiful of the Golden Era of motor racing design. The Gurney Eagle at Monaco was running in its earlier 4-cylinder 2.7 litre Coventry-Climax engine, which was its mount for the first half of the 1966 Formula One season before the Weslake-V12 was fitted following development and testing. Across the laneway from the Gurney Eagle was the 1961 BRM P57. This car is owned by Charles McCabe (who for the past few years has competed in ERA R3A ‘Remus’, which he was also competing in at Monaco). One of the Hall and Hall prepared cars, the mechanic was most enthusiastic in relaying the restoration story of this vehicle, having being a pile of bits in November 2013. It was McCabe’s childhood hero car, the BRM P57 that Tony Brooks piloted in 1961 and Jack Lewis in 1062. The chassis and numerous other original parts were found, but for instance the front left wheel is new, but the others original. The gearbox is original, but the 1.5 Litre V8 BRM engine is brand new. Built from original draftsman designs at Hall and Hall in the UK. Other original parts include the side bodywork, oil filter. 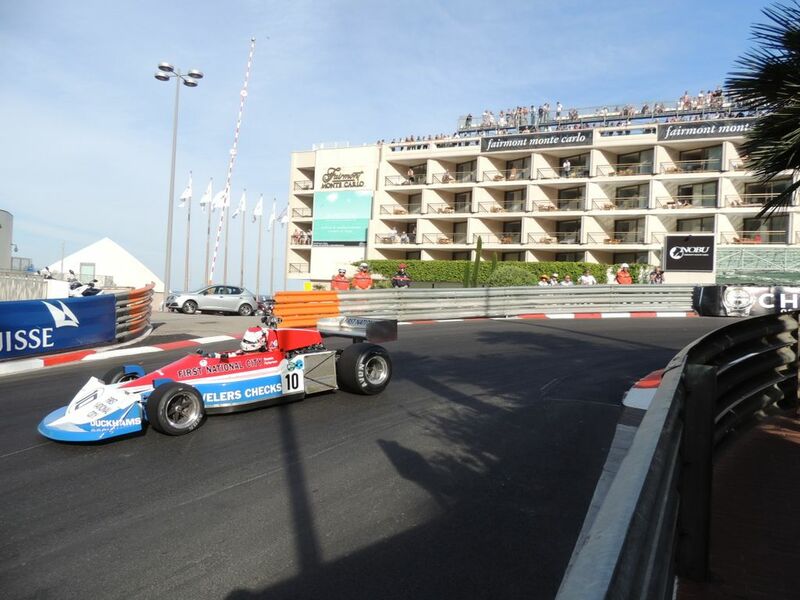 The re-build took just five-months full time, with Monaco the first event – not a bad event to debut at! It was at this point that I looked around, pinched myself and said that 24 hours in the sky was well worth it. Mid-afternoon arrived, and so did the remaining three cars for the entire event – the Bugatti group from the UK. Camera was rested and I was put to work assisting with getting the spares and tools from the support vehicle to the paddock area. Of all things left on the side of the road in Monaco, trust the Aussie & Kiwi to find an abandoned shopping trolley. Despite is shabby appearance; it came in very handy getting the boot full of items to the paddock in one load – with a few curious gazes en route. Focused on the two Australian Bugattis, assistance was provided in the washing department – the Bugs having gone through all conditions over the previous four days of driving needed a ‘spring clean’, although initial opinion of Berryman’s car was to leave it as was, as it would have looked like that when roaring around the unsealed surface of the inaugural Grand Prix de Monaco in 1929. Berryman’s car was given the all clear in scrutiny, but Cannon’s car was initially knocked back as they requested the guards be removed so it would be in ‘Grand Prix’ trim. Although there are photos of T51s competing at Monaco Grands Prix with them on, work commenced to unbolt. The issue, though was where to store them. I suggested with the use of cable ties that perhaps we could hang them from the marquee! A silly suggestion, but the only reasonable option to ensure they wouldn’t get knocked during the next three days. With the use of fuel drums from a next door competitor as a step, I went about the job of tieing the front, then rear two guards from the marquee structure. Cannon’s comment upon his return and seeing this was – looks like we have a Chinese laundry!